Jesus' parables highlight how different the Kingdom is from how his contemporaries thought it would be, and how "upside-down" it is compared to his society's and our society's values. The Kingdom starts small, but grows to be great. It starts growing, but it is surrounded by weeds. Sometimes the signs of the emerging Kingdom can be disappointing, but we need to stay hopeful and watch for the signs that it is appearing. In Jesus' time, the Jewish people expected a Messiah would forcefully (and probably violently) take political power from the Romans. They were waiting for dramatic, obvious, majestic, overpowering new kingdom. Jesus preached and lived a very different alternative to this: a kingdom with humble beginnings and slow but steady growth. It grows even amidst pain, sin, and suffering. Recognizing this should also give us hope that the Kingdom is indeed coming, sometimes despite appearances. The Kingdom of God is upside-down and counter-cultural in many ways that we can find throughout Scripture. Jesus' desert ordeal, the Magnificat, and Beatitudes all point to big "Good News" reversals. Many of us can lack faith that the Kingdom is breaking through right now or that we could make any substantial difference in making the world a better place. This results in a lack of motivation to even try. Others may be inclined to segregate the Kingdom to the spiritual realm, rather than understand that it has real implications in both this world and the next. In the parable of the weeds, Kingdom seeds grow alongside the enemy's weeds. The Kingdom grows even amidst pain, sin and suffering. We need to look beyond the weeds to see the signs of the Kingdom. Also, it is not our role to judge and root out the "weeds," but to focus on the Kingdom's growth. In the parable of the mustard seed, we see a kingdom that starts out tiny, and grows beyond expectations. The Kingdom has humble beginnings and could easily be overlooked, but it is surely coming. In the parable of the yeast the Kingdom is compared to leaven, initially imperceptible but eventually causing dramatic growth from within. The Second Vatican Council uses this image when discussing lay people and their role in transforming the world from within (Decree on the Apostolate of the Laity/Apostolicam Actuositatem, 2). View the week 2 public page for more ideas. If you are preaching or teaching on this topic, do not be hesitant to repeat, rephrase, or reinforce points found in the public pages. That is precisely the point: people need repetition to learn. It is also helpful to start homilies or presentations referring back to earlier ones in the series. The PDF file is the best quality and smaller file size. Use it for printing or emailing. 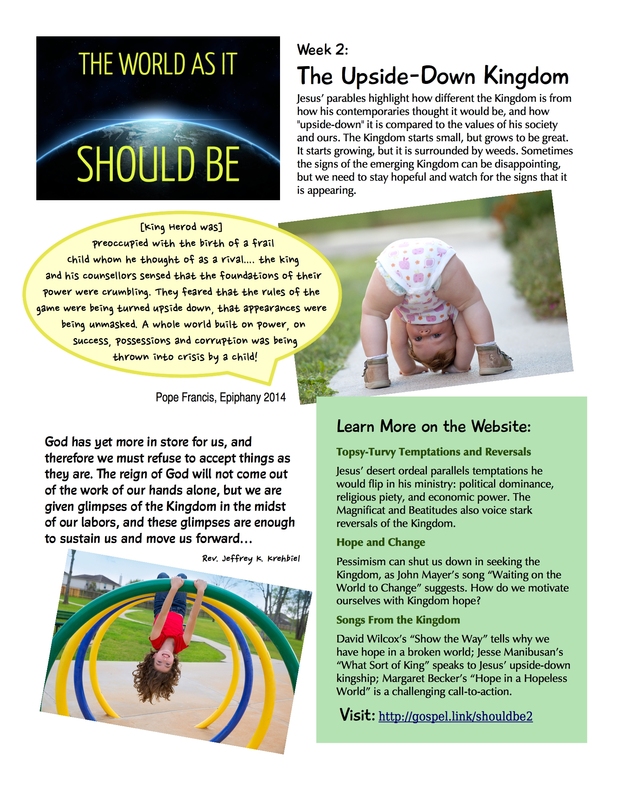 The JPG file can be used to paste it directly in another file, such as for your parish bulletin.